Star prints are undoubtedly having their moment in the spotlight this season and as an instant update to your style, it’s an easy addition to make to your wardrobe with minimal effort. I’ve already featured one post with starry outfit inspiration but it’s not limited to the decoration of printed tees and embellished trainers as denim also gets new lease of life with this 5-point print. The question is, whether to save or spend on your updated jeans look. 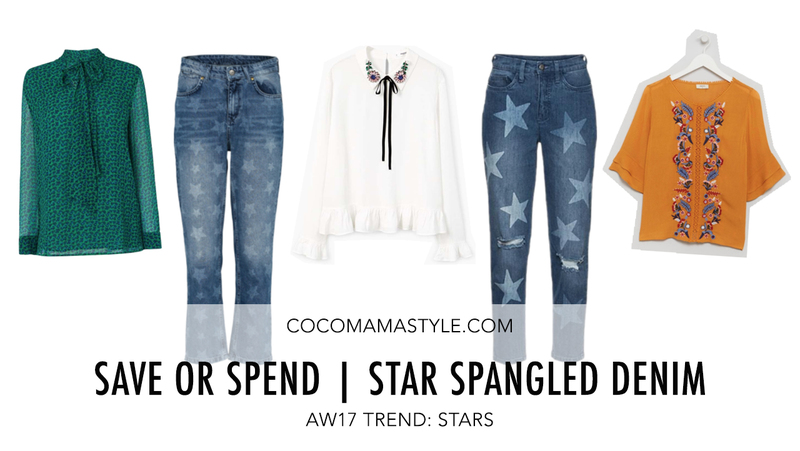 I’ve picked out two of the best pairs of star spangled jeans – one at either end of the scale – and three blouses to wear with them. Which will you choose: Budget or Blow out?